Our rustic black bear baby nursery decorating ideas can easily be adapted to a log cabin or an apartment in the middle of a busy, urban setting when space comes at a premium. The key is in choosing decorations in volume relative to the size of the baby's room. As you will see, bear themed items come in many sizes from large, almost life-sized bears to small stuffed toys no bigger than a teddy bear. The key to a successful design is to allow these majestic creatures to work in combination with other elements to mimic the great outdoors, the atmosphere nature lovers adore. This large trio is perfect for a nursery with plenty of room and and the beautiful moon wall light that the standing bear has on a string serves both as a night light and wall decor bringing atmosphere and an additional level of safety for those times when turning on a lamp or ceiling light could disturb a napping child. If all three bears are more than your nursery can accommodate, scale back to a single standing bear to hold the ribbon attached to the moon wall light to get the same effect. The beauty of a natural arrangement is that it will blend with practically any color bear baby bedding set. Large decals can also be used to save floor space and money in a budget-minded bear baby nursery theme. 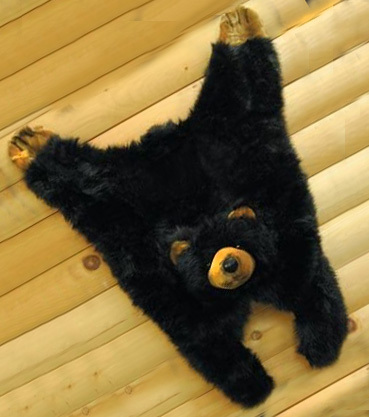 A faux bear baby rug is another item that can serve a dual purpose. This cutie will be equally appreciated as a floor covering and wall decoration. A fun craft project for a black bear baby nursery would be to stencil some authentic tracks either as a wall border or a trail leading to various spots in the room such as a reading corner, the changing area, the closet or to add interest to the front of the dresser or armoire. Go here to get a printable template that can be used to make a stencil pattern. The bear track stencil pattern can be used for painting projects and as a template to create appliques for a crib quilt. I hope that you enjoy and are able to adapt our black bear baby nursery decorating ideas to your project and that you will visit Unique Baby Gear Ideas and upload photos when you are done.